Prince of Persia: Warrior Within is one of my favorite games. I've not played it in years but it is one of the few games I purchased and played from start to finish. It is early world open sandbox puzzle. The story lets you wander freely and you open more area as you continue on. You have to figure things out and remember what to do through a complex map. I learned that there were often secrets hidden in places that you assumed that you would die and I would often leap off of cliff faces because finding them was exciting. My husband would ask why I was leaping off of cliffs and I would tell him as I spied an intriguing ledge invisible to the safe area above. I've started to wonder where that player went. When did I become worried about trying things? Where did my boldness go? Who was I now that I held myself so close to caution for fear of repercussions? It is an unpleasant question to ask oneself. Often, we are far down a road before we realize that we are on it. And like any well worth and defined path it is easy to stay on it. Each day can slip into the next and in the warm fuzz of familiarity and comfort. The familiar has its own rewards. But sometimes, no matter how wide and clear the road is... no matter how well marked... you can still be lost while knowing exactly where you are. And I hate being lost. It is not the same as experiencing what is new. Its that hollow, empty feeling as everything seems to fit but it is none of it is right. I remember being a bolder person. I didn't worry about failure. I was comfortable in silence but I didn't hide in it. I remember that I rarely walked on roads. My curiosity would pull me in one direction or another. And somehow I started walking and stopped looking around. Fortunately the path always has sides. Sometimes one climbs them, and others you jump down. It may be underbrush to wade through or a fog so thick who knows what is on the other side. But, I've always been good with finding my way and I think I can remember the simplicity in not worrying about what others thought of my choices. After all, there is exactly one person that has to live with the result of what I do. It's something that I am remembering. "When did I become worried about trying things? Where did my boldness go?" You grew older. You learned that time IS limited, life IS limited, and the time you waste jumping off cliffs is time you will never get back... so you take a shortcut if possible, adn then you can do something else with the time you saved. EVE suffers a lot from that. The game was built by 30-somethings in a place where winter nights last 16 hours for weeks. Lots of spare time and really nowhere to go. So why not spend 4 hours roaming just to kill a couple of fools? But the 30-somethings grew old. Their playerbase grew old. And most people, most of time in most places, barely can scratch one or two hours a day for leisure, subject to RL. And then, EVE doesn't just take sforever to get the rewarding bits... but failure is harmful and costs even more time. Time you'll spend with chores like rebuilding a fit rather than, you know, fly and have fun. EVE takes a lot fo time if you succeed and even more if you fail. So, jumping of a cliff in EVE? No way. Life is too short to waste it failing to enjoy a videogame, isn't it? Failure and the rewards for success are what make Eve worthwhile, imo. Losing a ship isn't necessarily "failure" and being risk averse will limit potential gains. I went from my 30's to my 30's so far. I've been playing video games for 21 years. I still enjoy them and don't consider my life wasted for the time spent. It has little to do with 'a video game' and more to do with the person that I am. I'm that same person in this game, at work, or shopping at the store. Some come to games to be someone else. I come to games as who I am and even then, in a game flaws of character and personality can be found. There is reward to be found in a game as well Onions. Life's length isn't the issue, its how we live it. I have bad habits and like any bad habit they have to be examined and made better. Sweet baby jubus Onions... you are one jaded fool. "You learned... ...the time you waste jumping off cliffs is time you will never get back... " NO. The time SPENT taking leaps of faith are the BEST times!! The time spent on the road less traveled is the only path that teaches you anything! I can guarantee I am older than both of you (possible put together) and the time I have spent jumping off cliffs has been by far the BEST time I have ever spent. The reason playing EVE has real value, real investment is because Loss is Real in EVE. Because when you do win, you win for real... you win against real adversity... real loss. Yea it's all just pixels and recycled electrons... but the time and effort are real, and the players investment is real... so the impact can be very real, in both loss and in the triumph of winning. Apparently I explained myself poorly. I don't say "don't take chances never". I say that at one point, being rewarded by repeating a succesful action will matter more than taking a chance. Talking EVE: when was the last time you made a silly fit? You don't make them once you know it's silly. You learn to exploit every last % of bonus of the ship and squeeze it to EFT proficency. Missile Confessor? Blaster Svipul? Never! They're absurd, it's obvious! So good bye jumping off that cliff because you know (for sure?) that there's nothing at the bottom. You've learned. And as soon as you learned you stopped taking leaps of faith. You started calling them "mistakes" and yes, they were a blast! But you no longer do them. Growing, learning, being a better player... call it whatever.. But EVE doesn't rewards failure. Ask Brave Newbies, how brave they feel now that they're not losing noobships and there's a lot of effort in stakes each time they undock. And so EVE teaches to be proficent... which may be boring... but there's no reward to move away from the safe side and fail. You joined with other players. If you did something silly in that game you only "lost your ship". 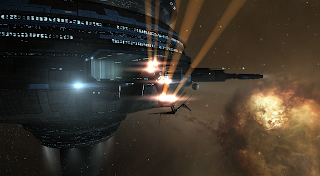 If you do something silly in EVE, you lose your ship AND put a loss to the corp killboard AND get taunted by the enemy AND your friends get taunted for your loss. The only way to be bold is being alone. Start a nameless alt, join no corp and go do something crazy! Or you know, conquer your fear of judgement. Especially in a game. You're suggesting anonymity is a requirement for emotional freedom, that's silly or should be anyway. I actually don't enjoy doing random crazy things because they don't make sense. As Kaeda says, I've allowed the judgement to grow into a wall I could no longer see over and my personality is such that can become a paralyzing situation for me. It isn't about being alone. It is about personal strength and being able to climb that wall of judgement. While I appreciate the disconcerting feel of being lost despite knowing exactly where one is, speaking for myself only, I try to by cautious about looking to the halcyon past for first-rate guidance. Memory is a deceptive thing. Memory dumps all the mundane workaday moments and retains only the sparkling atypical moments. Little wonder the present never measures up. Memory hasn’t yet edited out the wearisome parts. Perhaps I’m merely growing increasingly comfortable with aging (good thing too being the old fart that I am). Not entirely trusting memory’s narrative, I find myself more than happy to retain and use the non-narrative skills I’ve acquired over the years despite that meaning I very probably won’t tend towards my supposedly carefree past. It’s a curious place to sit. These days I gamble less often but when I do gamble, I gamble big. Being supposedly wise now, I rest confident that those big gambles, when I take them, are, all things considered, judicious courses of action meaning I second guess myself less. It’s an intriguingly pleasurable sort of carefree. I like it. Novelty wears off eventually. After a while, we start to realize that beyond that hill is... another hill equally as pretty. And you can only see so many hills until you start to realize they're all the same. What you're describing is the curse of knowledge. The more we know, the less mystery there is in the world. And yet, the more capable we are of making accurate judgement that are critical to keeping us successful. "I've seen people die from eating the green berries. I'm not going to 'explore' those." What you've gained is the ability to stand in wonder at things that require knowledge to really appreciate. For me, it's watching my kids discover things for the first time and enjoying the little moments that matter so much. Great, I take a path... it leads to more nature out there. Pretty. Cool. But I can find it anywhere, and I realize that. My daughter's first birthday... that is truly precious and awe-inspiring. Part of it is that games changed. There isn't much leap before you look in gaming anymore. Not even for secrets. In the bad old days of Nintendo Hard we'd play for 20 levels jumping over bottomless pits that'd kill us. Then they'd toss in one that isn't actually bottomless and put something there. To find it we had to do what the game's rules trained us not to do. There were no hints or guides, that pit looked exactly like all the others in 8bit land. Or another easier example, when we all played Mario for the first time we pushed down on every pipe when we first ran into it. Just in case. I'd like to think that if the developers had the resources to do it back in the day they'd have given a visual clue, no matter how small, like we have now. Some people call it hand holding, but I like to think it's simply a matter of game resources allow developers not to use leap before look puzzles anymore. Anyway, the result is that I don't think we've changed. Games have just changed. Also worth noting that many early console games were based of arcade machines. Arcade games were designed to eat as many of your quarters as they possibly good, they weren't just 'hard' being hard was the business-model. That influence lingered for a while in the early consoles, stuff like mega man & kid icararus to me has a pretty clear 'arcade hall' legacy. I miss part of the arcade hall mindset. Simple easily understood rules becoming harder and more complex as the game progresses, without the rules changing or adding anything major of note. You can pickup the basic rules of any of those old games in 5 minutes, and have everything you need to know to beat it right there. It may be hard to do so, but after that 5 minutes it's just mastering those rules. Now days most games have entire systems I don't even use except in specific instances when the game makes me. I've no real idea of the rules behind them at all, much less anything approaching mastery.